Savory Bean Gravy. Vegan and Oil-free! Hello beautiful readers! I’ve been absent from your inbox for a few days. It’s good to be back! And I am super excited to share this fabulous and nutritious gravy idea with you. Why I never thought of this before is a mystery to me. It’s such a simple recipe and it’s more delicious than any brown gravy I’ve ever had! PLUS, it’s made with beans for an extra heapin’ helpin’ of nutrients. Hello, perfect gravy! No thickeners needed. No oil needed. Yeah, it’s good. Makes about 2 cups. Enjoy! Why not add some nutrients to your gravy with beany goodness in every drop!? Blend all ingredients until smooth. Adjust water for desired thickness. Warm on the stovetop. That's it! This is a simply awesome idea. ie simple and awesome. I have a nut / lentil / tofu / bean loaf in the freezer I made with my not terribly top secret anymore recipe a couple of weeks ago. Going to have to try this gravy to go with it. All I can figure out to say right now is that you are a genious! It's not nearly accurate enough, but you have me tongue tied! Hi, thanks for this and other great recipes. 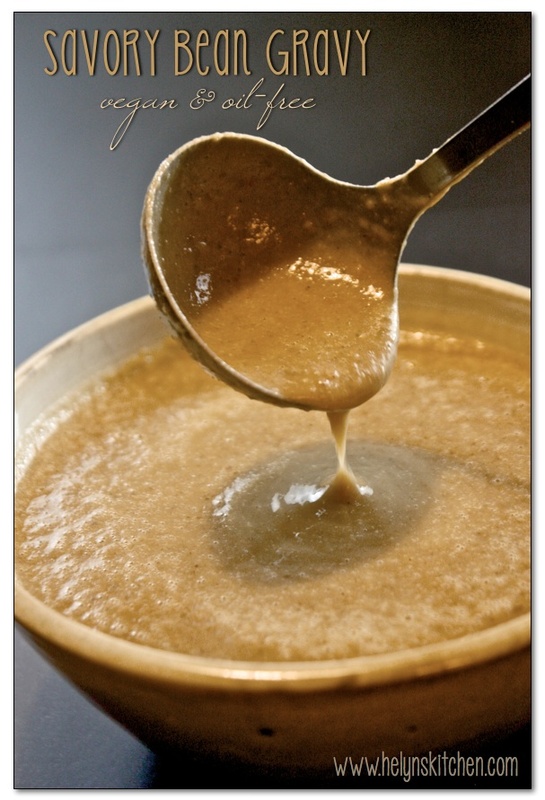 I am allergic to soy, can you tell me what the miso does for this gravy, is it for flavor or consistency? Thanks so much. You're welcome! The miso is for flavor. You could use chickpea miso which most health food stores have and is soy free. Hope this helps! Hi Helyn! I'm so excited to see a bean-based gravy because my hubby doesn't like mushrooms and most vegan/plant based gravies are mushroom-based. Looking forward to making this! P.S. I tried to make the apple/mushroom sausages with oats instead of soy curls and the taste and consistency were definitely off. Maybe it was me but based on how they turned out I don't think I would make them again, just an FYI! Thanks Laura! Yes, I'm not surprised about the sausages. The soy curls really make them what they are.. Sorry they didn't turn out well for you using the oats! I can only buy barley miso (in England) which tastes horrible to me. Any suggestions for subs? You could sub with some tamari or any other low-sodium soy sauce. Thank you so much, I have never heard of chickpea miso but will find it asap! Helyn – this is down right fantastic! LOVE this idea. This is absolutely wonderful! Best gravy recipe I've tried anywhere. Thank you so much for all you do to make whole food eating delicious. Mine didn't look the same colour but it was really tasty. Going to have to share this recipe with mum as healthy gravy alternative to the massel instant vegan one she uses for us. I think it would work equally with lentils instead of beans. I think I would leave out the miso though as a bit salty. I don't have the spike seasoning so used mixed herbs which worked well. I made a mac / cheese dish for the kids once on hols using a thinned down red lentil dahl mixed with some cheese (would work fine with nooch though too) – I liked it better than the flour version of roux / chs sauce. Going to perhaps try the left over gravy as a salad dressing. Maybe thinned a bit?? Yes, I'm sure it would work well with lentils. And depending on which bean you use I guess the color could vary greatly. Salad dressing? There's an idea!! You're a genius!!! I was just wondering what I was gonna do for gravy, now that I've given up gluten. I can hardly wait to try it!